One can only imagine what thoughts ran through the minds of those tens of thousands of emigrants who passed the wide array of sights along the Oregon Trail, but of those who chose to take the Jeffrey-Goodale Cutoff, they just might have thought they had entered hell. 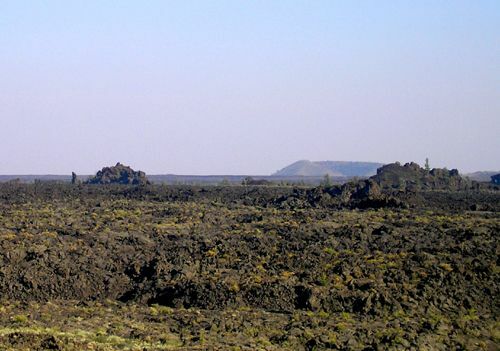 The cutoff was a 230 mile-long northern alternate to the main Oregon Trail that followed the Snake River about 100 miles south of what is today the Craters of the Moon National Monument. However, after 1863, most emigrants used the Jeffrey-Goodale Cutoff in an effort to avoid hostilities with American Indians, which were escalating along the main trail. The trail was actually first promoted as early as 1852 by John Jeffrey who traced the traditional Shoshone migration routes and wanted to generate business for his ferry at the mouth of the Blackfoot River. Although the cutoff received some use from 1852 to 1854, it was not until a decade later that a large percentage of Oregon Trail traffic began to travel the desolate route. By 1862, the Northern Shoshone and Bannock tribes were beginning to resist the intrusion of settlers into their homeland along the traditional Oregon Trail and in August, 1862 Bannock Indians ambushed a wagon train at Massacre Rocks, killing 10 people. The growing Indian hostility along the trail resulted in increased demand for a safe alternative and that same year an emigrant party asked guide, Tim Goodale, to lead them west from Fort Hall on the cutoff pioneered by Jeffrey. They not only hoped to find less Indian resistance on the alternate trail, but also thought the cut-off would enable them to reach the Salmon River gold fields more quickly. Goodale succeeded in leading the group of 1,095 people, 338 wagons, and 2,900 head of stock safely from Fort Hall to Boise. It took this enormous wagon train — the largest to travel any section of the Oregon Trail — over 3 hours to get into or out of camp. By the following year, seven out of every ten wagons en route from Fort Hall to Boise took the cut-off instead of the main Oregon Trail. 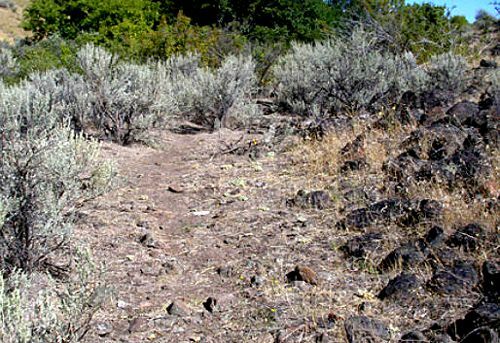 When emigrants began to take their west-bound wagons along an old Indian and trapper’s trail past the lava, they had to develop a wild and winding road. In many spots, they barely had enough space to get by and could not avoid the lava stretches. However, they slowly crept along, leaving the path strewn with parts of broken wagons. The 230-mile spur headed north from Fort Hall toward Big Southern Butte, a conspicuous landmark on the Snake River Plain. From there it passed near the present-day town of Arco, wound through the northern part of Craters of the Moon National Monument, went southwest to Camas Prairie, and ended at Fort Boise. This journey typically took two to three weeks. The cutoff took its toll on the travelers and their wagons. The rugged lava restricted travel to one lane and the path along the edge of the lava flows was circuitous, making progress was slow. Typically passing through the area in late July, Wood dried out in the desert air and shrank, causing wheels and boxes to come apart. For years, pioneers traveling through the area would find the trail littered with pieces of broken wagons. For nearly 50 years, westward-bound pioneers used the Jeffrey-Goodale Cutoff. Later, miners moving ore to railroad depots and stagecoaches carrying passengers to the towns of southern Idaho took the route. But the advent of the railroad and automobile led to the demise of the wagon route. Today, the trail can still be seen along Highway 20/26/93 between Craters of the Moon National Monument and Carey. It winds through the northern end of the monument out of sight of the road and intersects the highway 3.5 miles west of the Craters of the Moon National Monument Visitor Center. From that point on, watch for the dirt road as it follows the edge of the lava flows north of the highway. The cutoff is particularly easy to pick out 5.7 miles west of the visitor center, where the road drops down a steep incline. On a ranch not far from the monument, a small mound of rocks sits in the middle of a pasture. The loose stones look like they were piled up to make it easier for tractors to pass. But long-time residents of the ranch say the rocks mark the site of a 100 year old grave. During those long ago times, the pioneers endured extreme hardship; and some – like the grave of this little girl – never made it. According to the tale, the little girl, who was walking behind a wagon, was bitten by a rattlesnake and died two days later.